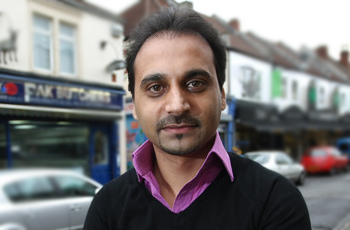 Abdul Raoof Malik born in Easton, Bristol 1973, one of 7 children; left school after failing his GCSE's and defeated all the odds by becoming a successful entrepreneur and opening the door for others to follow. Although Abdul failed his GCSE's on his first attempt he would not allow this to determine the course of his future - coupled with bundles of determination and perseverance he returned to complete his education and also unleash his entrepreneurial gene. Analysing his locality (Easton) Abdul identified a demand for a traditional butcher that catered for the large Muslim community, as well as the other diverse communities. A business has to be involving, it has to be fun, and it has to exercise your creative instincts"
Abdul's philosophy was to have fun and involve all regardless of religion and cultural differences. He immediately set about communicating facts about Halal meat within surrounding areas; once people learnt that Halal meat tasted better because of the very little blood content and lasted approximately 7 days longer due to the reduced bacterial/toxin content, regular customers rose at a rapid rate. I have always tried to build bridges between the many different diverse communities that reside in my neighbourhood, whether it is business or community work my ethos has been about uniting our neighbourhood and thinking 'outside the box'. A simple example of this was when I gave Halal turkeys to a Homeless charity over the Christmas period; most people think that Muslims have nothing to do with Christmas, but by supplying Halal Turkeys I was able change perceptions,"
Such all-inclusive work ethics have ensured the continued success of Pak Butchers. What started as a small sole trading business has now become Pak Butchers UK Ltd., with several branches throughout the South West. With numerous awards under his belt including: Bristol East Side Traders Award; Business of the Month from Bristol Evening Post and the Jury's Hotel; Runner up for Business of the Year as well as being shortlisted for 'Muslim 100 Jewel Awards' by Lloyds TSB Bank and featured on 101pakistanis.com, Abdul is now considering franchising to allow others to experience and be part of its amazing success. Mentoring young people who want to start their own business. Abdul has also volunteered with 'Community resolve' a local organization that works with deprived and troubled youth to move on from where they are to a new positive and constructive community life. Working with local Mosques and other religious organisations to facilitate cross cultural bridges between different communities - Abdul set up a Muslim Funeral Committee to help repatriate deceased Muslims to their desired countries of burial and was nominated for the Inner City 100 Financial Time's Awards. Working alongside the BEST (Bristol East Side Traders) Abdul has supported work to regenerate the local area with new shop fronts and traffic calming systems. Community point office - an office dedicated to community issues and a gathering place for agencies to better access the local community. Aiding Bristol City Council to establish a dedicated kitchen for Halal School meals and has now been approached by Cardiff City Council to help execute the same project there. A Traders Association - Abdul has helped set up 'Stapleton Road Traders Association', Stapleton Road has often been listed as the worst crime hot spot in the country, Abdul has helped turn this around by engaging local traders with the community and getting them to make simple and effective changes to enhance the shopping experience for people who visit the locality. Police Bike Sponsorship - Abdul sponsored an off road bike to patrol the local cycle tracks and parks to help the locals cut crime and anti-social behaviour. Working with the Inspector of the region for policing strategies in the local area and held regular police 'best surgeries' within Easton Bristol. He was also the first councillor to open and run a local Legal Advice Surgery' dedicated to his ward; Abdul was awarded a 'Community Champions award' along with Maleeka Bokhari who was the co-founder of this project. Abdul has been approached by all the major political parties, to stand for Council Election within Easton, due to his involvement and contacts with the local community. Between 2005 and 2009 he was elected councillor and was the first Muslim to be elected on the Council and assisted in delivering a local 'PREVENT' program. Furthermore, he was part of a 'Building the Bridges' conference. He was nominated by his party to become Bristol's first Muslim Lord Mayor in 2007. Abdul now sits as the only BME representative on the City of Bristol Liberal Democrat Executive and has been chosen as the parliamentary candidate for the Bristol East Constituency. I believe in empowering people to become leaders and I inspire change by delegating tasks to others to share the experience and inspire more leadership,"